3.1 Is it a Life Insurance Policy or an Investment? Life insurance can be good way to ensure that loved ones are taken care of in the event of an unfortunate situation. However, owning a foreign life insurance policy with cash value can prove to be more of a headache than it’s worth. We’ve come across such types of investments regularly in our offshore compliance cases; the reporting and tax obligations can be burdensome. Hopefully, this article will help foreign insurance policy owners understand their U.S. tax obligations. A whole life insurance policy is part investment and part life insurance. Such policies have two basic financial components – cash value and death benefit. Insurance companies take policy premiums and invest them. The investments in turn are used to pay death benefits and “cashed out” policies. The cash value of the policy increases as premiums are paid and as the investment grows. This investment portion of it is tax-deferred – no tax will be paid on the cash value unless the policy holder cashes out the policy. The policy holder will pay a tax on the investment gain. The death benefit, or face value of the policy, is paid to the beneficiaries tax-free. Insurance companies in the U.S. are heavily regulated as stock or mutual companies. Additionally, they pay taxes on the investment income they earn from investing policyholders’ premiums. A foreign life insurance company, on the other hand, cannot be regulated by the U.S. nor taxed by the U.S. unless they happen to have U.S. source income. They may have few regulations and possibly pay little or no foreign taxes. Many foreign life insurance policies are more investment oriented than actually life insurance policies and potentially have a huge advantage over U.S. life insurance companies. In order to level the playing field and close this and other loopholes, Congress enacted the Tax Reform Act of 1986 and subsequent legislation. Since the U.S. has no authority to tax the foreign life insurance companies directly, they imposed onerous reporting requirements for U.S. policy holders of such investments. As indicated above, a whole life insurance policy is part investment and part insurance product. Taxation of such policies is determined based on the primary function of the policy. Is it a Life Insurance Policy or an Investment? IRC Code §7702 contains a two-pronged test. An insurance policy is non-taxable if it meets either (i) the cash value accumulation test or (ii) the guideline premium requirement and the specified cash value corridor. The CVAT requires a fairly straightforward determination: does the cash value of the insurance policy exceed the present value of all future premium payments on the policy? A contract meets the guideline premium requirements of section 7702(c) if the sum of the premiums paid under the contract does not at any time exceed the greater of the guideline single premium or the sum of the guideline level premiums as of such time. Interest at the greater of an annual effective rate of six percent or the rate or rates guaranteed on issuance of the contract. If the policy does not meet either of the above tests, IRC Code §7702(g)(1)(A) becomes applicable: “If at any time any contract which is a life insurance contract under the applicable law does not meet the definition of life insurance contract, the income on the contract for any taxable year of the policyholder shall be treated as ordinary income received or accrued by the policyholder during such year.” In other words, the policy holder is subject to a tax on the increase in cash value of the policy each year, even if the policy isn’t actually cashed out. U.S. Excise Tax: This may be one of the more ridiculous parts of the Internal Revenue Code. IRC §4371 requires policy holders to file a quarterly excise tax form (Form 720) to report and pay a 1% excise tax on insurance premiums paid to foreign life insurers. Form 720 was meant for businesses to fill out for miscellaneous taxes such as transportation of persons by air, kerosene use, aviation gasoline, liquefied hydrogen, and other arcane items. 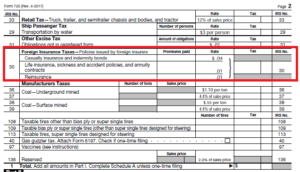 IRS sneaked in “foreign insurance taxes” near the top of the 2nd page of the form. Because the form was designed for businesses to fill out, it cannot be filed using an SSN. Policy holders must apply online for an EIN, solely for purposes of filling out this form and paying the excise tax! U.S. persons owning foreign financial accounts with values in excess of $10,000 at any point during the year are require to file FinCEN 114, commonly known as FBAR with the Financial Crimes Enforcement Network (“FinCEN”) on a yearly basis. “Foreign financial account” includes an account that is an insurance or annuity policy with a cash surrender value. Foreign life policies are also considered “specified foreign financial assets” for Form 8938 purposes and must be reported annually if the value exceeds the applicable threshold. If there’s any good news coming from this, it’s that foreign life insurance policies are usually not considered to be passive foreign investment companies. There is no Form 8621 filing requirement if the holder of a life insurance contract does not have control over the available investment accounts. IRC §1297(b)(2)(B)(3), Treas. Reg. §1.367(a)-2T.